This one doesn't even look much better than the Koto one either, oh well. It seems clear to me, and it doesn't look that good. Oh, nice. Zero series figures. Out of curiosity, though, how many network timeline figures have been made? None come to mind off the bat, and I'd love to see what they looked like. I guess the people who could give a damn are taking a "break" now. Thankfully and hopefully stays that way. Oh and props Witch for acknowledging the superior sub-series. I wonder if they're having to put off any Network figures because of the inane (and sorry, but yeah, it's an inane contract they drew up) contract between the various copyright holders for both the Network and Star Force series' animated ventures. Perhaps... one day it'll run out and we can start to get things for it again. @ WGAS At least 4 in the old Bandai Rockman line that was only officially released in Japan in the late 90s. Extremely hard to come by these days, though. Not gonna judge until I see clear pics posted online, but it looks good so far, the head doesn't seem to dwarf the body like the Kotobukiya kit. Hopefully we get the guardians or Protoman after this one too. the head is a little better but, now the chest and abdomen are the ones that are dwarfed. Also the appendages on the ends of the limbs are really thin almost stuck to the "skin". So far this doesn't look that great to me. Uggggghhhhhhh...... PASS! SERIOUSLY PASS! What the hell is up with his neck? Its stretched! His head looks like its floating! And his eyes?! I mean, hopefully his eyes look better in hand but the photo makes him look weird. And his hair? Where does it start because it looks like its growing from his back. Ugggghhhhhh.... I'll be passing on this stupid one and hope the next one will be better. Like I'd rather have Vile ver. mkII than this! Or Colonel! Even better a Colonel and Iris 2 pack! Or wheres Protoman?! Come on Bandai! What the hell is wrong with you. Your f***ing up the line. This is going to fail like the Kotobukiya one. The Wonder Festival ones are WAY better than this! The fans! Theyre doing the impossible and your not! And they have little resources and funding and you Bandai with all your corporate staff, millions of funding, and resources, you give us this? THIS???!!! COME ON!!!!! I SWEAR WE'LL BE SEEING THIS AGAIN AS A REPINT AS OMEGA ZERO, WATCH!!!!! Relax Megafan you'll be alright and so will this line. Since it's confirmed to be released on October. Does this mean there will be no Megaman exclusive for this year's Comic Con? If anything Bandai could have an exclusive by releasing a Plated Zero V.2 to match with the Plated X exclusive. 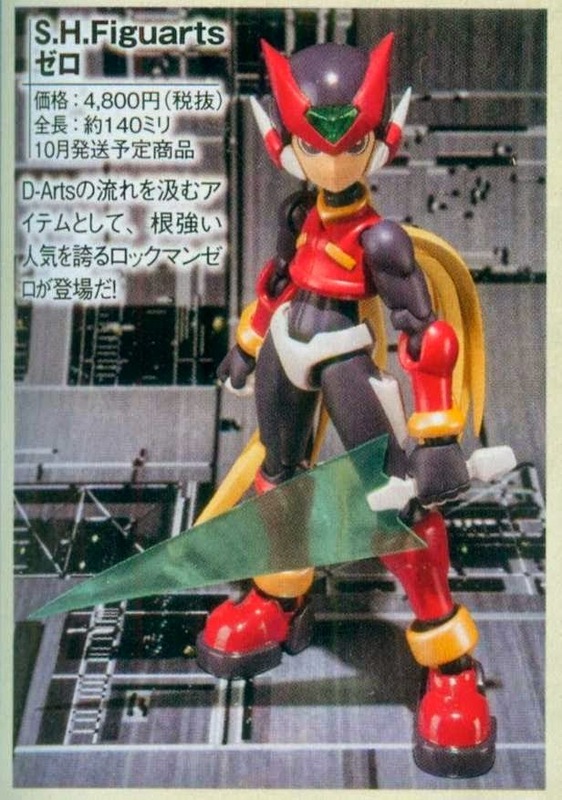 I always wanted a figure of Megaman Zero but they were always too expensive to buy. Now this is one that I can actually afford. I look forward to its release. I can sit this one next to my figures of the other Megaman characters.